Come the election eve 2012, Obama supporters will not be chanting four more years, they will be saying “fore” more years. Mitch McConnell said what most Americans have thought during the Obama presidency. McConnell stated, “For four years, Barack Obama has been running from the nation’s problems. He hasn’t been working to earn reelection. He’s been working to earn a spot on the PGA tour”. 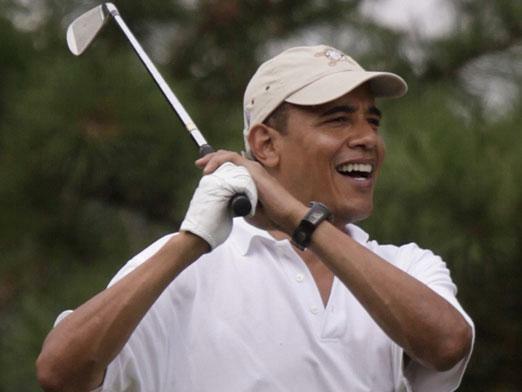 After over 100+ rounds of golf and no clue how to fix the economy or help create an environment that is convulsive to job growth … but he can certainly play golf. The Senate minority leader delivered a scathing speech Wednesday hitting the president for failing to solve the country’s problems. Senate Minority Leader Mitch McConnell (R-Ky.) delivered a scathing speech at the Republican National Convention on Wednesday night, saying that President Obama has spent more time on his golf game than solving the country’s problems. “For four years, Barack Obama has been running from the nation’s problems. He hasn’t been working to earn reelection. He’s been working to earn a spot on the PGA tour,” McConnell said. America cannot take another “FORE” years of a President who has acted so small in the face of such huge issues. America needs a leader, not a community organizer. Could it be that Barack Obama has been working very hard … very hard to further a Marxist agenda … a Marxist agenda that implied a 2012 PPresidential election was not a given. Fruition would take more time. Considering the current negative direction of Barack Obama low key reelection campaign … could it be that a forthcoming “declared” National crisis implies an Executive Order will “postpone” the 2012 Presidential election. Think about it. The words of North Carolina’s Governor Beverly Perdue did not emerge from a vacuum. Republicans rebuked North Carolina Gov. Beverly Perdue after she suggested Congress suspend elections for two years so lawmakers can get to work stimulating the economy unencumbered by anxiety about what voters think. The governor’s office has since claimed the remark was “hyperbole.” But the North Carolina GOP isn’t buying it. “We’ll just call it an unconstitutionally bad-idea,” he said in a statement. The Constitution dictates elections for the House be held every two years. The Raleigh News & Observer first reported that Perdue, a Democrat, suggested a change in protocol during a speech at a local Rotary Club. A one term proposition? The implication? Obama: One nice thing about the situation I find myself in is that I will be held accountable. I’ve got four years. Lauer: You’re going to know quickly how people feel about what’s happened. Obama: That’s exactly right. And a year from now I think people are going to see that we’re starting to make some progress, but there’s still going to be some pain out there. If I don’t have this done in three years, then there’s going to be a one-term proposition. He and Michelle would rather be at Martha’s Vineyards relaxing with their cronie friends. How would we know? Do you know of any credible evidence to support such a serious claim regarding Obama?